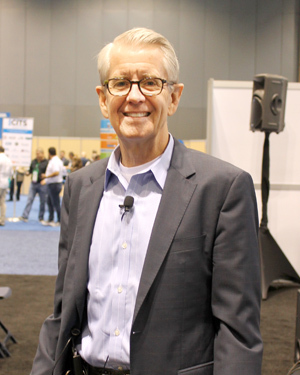 A common mantra among janitorial/sanitary distributor salespeople is, “If I could only get in front of the decision makers — if I could just spend a few minutes in front of them, I think I could convert them,” according to E. Jeff Gardner, president of Maximum Performance Group, LLC. “I’m going to share with you a process that is not just theoretical — it is something that works,” he said. “Referrals work. Referrals convert to customers 50 to 70 percent of the time. No other sales or marketing technique or strategy comes close to that, according to www.insidesales.com. “Very few salespeople actually work referrals. ■ Start serving and growing the new customer. an appointment with a decision maker. Gardner said it typically takes 10 cold calls to get an appointment with a buyer, and, on average, one out of five appointments result in a new customer — that translates to a 20 percent close rate. Gardner said in today’s marketplace there are more and more barriers to getting first appointments. He also defined a sales referral, which takes place when an existing customer or other business associate recommends and provides the name and contact information of a prospect decision maker to the salesperson. It generally takes one to two referrals to get a first appointment with a prospect decision maker. Furthermore, it takes a average of five prospect first appointments to get one new customer. Again, a 20 percent close rate, Gardner said. “That’s one-fifth the time it takes to generate a new customer making cold calls. Referrals are a timesaver,” he said. “Those of you who are in a sales leadership role should start measuring, when you get back to your business, conversion ratio. How many first appointments did my salespeople have with new prospect decision makers that turned into customers? That is probably the most important number you have. The result: 33 percent new customer conversion ratio. The result: 100 percent new customer conversion ratio. The result: 75 percent new customer conversion ratio. The result: 66 percent new customer conversion ratio. Gardner said when he hears business owners complaining that their salespeople aren’t making enough cold calls, he tells them to go out with their people and make calls with them. “So, I did it. It was a fairly good call. It went OK. He said he has never had a sales manager or a coach actually make the call. They always watched him make the call. “If you get a new referral, ask some questions about the referred company. Get more information. Get a sense of who the person is you will be meeting,” Gardner said. “Establish a reputation. The person I’m being referred to knows I’m doing business with somebody who is a business friend of their’s, so he or she at least knows I’m somewhat credible — I’m not just some commissioned sales guy knocking at the door,” Gardner said. ■ Bottom line: more new customers. and work with current customers,” Gardner said. Gardner outlined what he calls the Maximum Performance Referral System. Gardner suggested some scripts salespeople can use when seeking referrals. 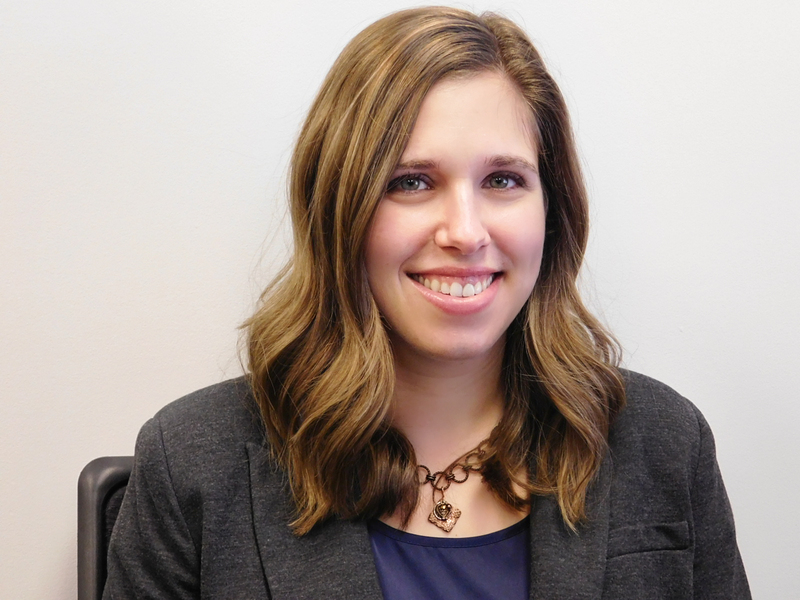 “This is my most basic: ‘I’ve enjoyed working with you (this is a current customer) during the past couple of years. Thank you for your business. I really appreciate it,’” Gardner said. Gardner suggested a script for salespeople who have not asked for referrals in the past. “Go to your best customers and ask, ‘What do you like about doing business with us? What do you like the best?’” Gardner said. “A customer might say, ‘You guys are so easy to work with. I really appreciate the service.’ At this point, you want to say, ‘What is it you like about the service. What is it that we do that you like?’ We want the customer to get specific and quantifiable. “He or she might answer, ‘Whenever I have a question, I always get a quick answer and that saves me a lot of time.’ This is somewhat vague. I want to quantify that, so I might say, ‘I’m curious, how much time do you think you save on a day-to-day and/or weekly basis?’ I want the customer to tell me two hours or one hour, whatever it happens to be, and then I thank them and ask for a referral. Gardner said the following script is one of his favorites upon receiving a referral to a potentially large account. In another scenario, a salesperson calls on a decision maker, but is unable to convert this particular person into a customer. Nonetheless, there still is the opportunity to receive a referral. Gardner shared an incident concerning a salesperson who had given him a referral. He had thanked her by sending a box of chocolates. “That salesperson came up to me recently and said, ‘Jeff, I’ll never forget that box of chocolates you sent me seven years ago when I gave you that referral,’” Gardner said. “It doesn’t have to be an expensive gift — $10, $15, maybe $25 at the most. One of the things I give, because I’m in the education business, is a $15 or $25 gift card to Barnes & Noble. One of the distributors we work with gives car washes. It’s not about the money. 453 Providence Road, Palatine, IL 60074. U.S. government trade figures for the first 11 months of 2016 indicated raw material imports were down in three categories outlined: hog bristle, broom and mop handles and metal handles compared to the first 11 months of 2015. For November 2016, two categories outlined reported increases: hog bristle and brush backs, compared to November 2015. Import totals for the first 11 months of 2016 were up in five finished goods categories outlined: toothbrushes, hairbrushes, paint rollers, paintbrushes and upright brooms, compared to the first 11 months of 2015. In November 2016, four categories outlined recorded increases: toothbrushes, hairbrushes, paint rollers and upright brooms, compared to November 2015. 251,327 kilograms imported during the first 11 months of 2015. China sent 202,960 kilograms of hog bristle to the United States during the first 11 months of 2016. The import total of broom and mop handles during November 2016 was 1.4 million, down 7 percent from 1.5 million for November 2015. During the first 11 months of 2016, 15.8 million broom and mop handles were imported, down 5 percent from 16.6 million for the first 11 months of 2015. The average price per handle for November 2016 was $1, up 13 percent from the average for November 2015 of 87 cents. The average price for the first 11 months of 2016 was 90 cents, down 5 percent from 95 cents for the first 11 months of 2015. November 2016 imports of brush backs totaled 662,171, up 16 percent from 571,017 for November 2015. During the first 11 months of 2016, 6.7 million brush backs were imported, up 3 percent from 6.5 million for the first 11 months of 2015. Sri Lanka sent 3.2 million brush backs to the United States during the first 11 months of 2016, while Canada shipped 2.6 million. The average price per brush back was 50 cents during November 2016, down 1 cent from the average price for November 2015. For the first 11 months of 2016, the average price per brush back was 46 cents, up 1 cent from the average price for the first 11 months of 2015.
first 11 months of 2015. During the first 11 months of 2016, China exported 10.2 million metal handles to the United States, while Spain sent 9.5 million and Italy shipped 3.2 million. The average price per handle for November 2016 was $1.09, up 6 percent from the average price for November 2015 of $1.03. The average price for the first 11 months of 2016 was 91 cents, down 7 percent from the average price for the first 11 months of 2015 of 98 cents. corn were imported, the same as for the first 11 months of 2015. Mexico shipped nearly all of the brooms to the United States during the first 11 months of 2016. The import total of brooms and brushes of vegetable material during November 2016 was 240,935, down 23 percent from 312,009 brooms and brushes imported during November 2015. During the first 11 months of 2016, 3.2 million brooms and brushes were imported, down 40 percent from 5.3 million for the first 11 months of 2015. 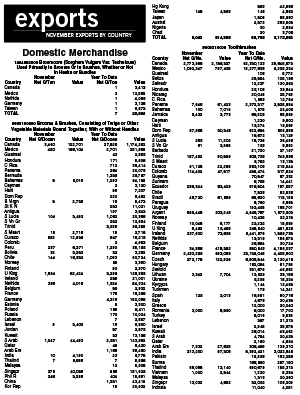 Sri Lanka exported 1.6 million brooms and brushes to the United States during the first 11 months of 2016, while Canada sent 642,643. The average price per unit for November 2016 was $1.55, up 18 percent from the average price for November 2015 of $1.31. The average price for the first 11 months of 2016 was $1.18, up 15 percent from $1.03 for the first 11 months of 2015. The United States imported 85.4 million toothbrushes in November 2016, up 14 percent from 74.6 million imported in November 2015. During the first 11 months of 2016, 1 billion toothbrushes were imported, up 6 percent from 942.1 million imported during the first 11 months of 2015. China sent 760.1 million toothbrushes to the United States during the first 11 months of 2016. The average price per toothbrush for November 2016 was 21 cents, down 9 percent from the average price for November 2015 of 23 cents. The average price for the first 11 months of 2016 was 22 cents, down 8 percent from the average price for the first 11 months of 2015 of 24 cents. November 2016 imports of hairbrushes totaled 4.3 million, up 26 percent from 3.4 million for November 2015. During the first 11 months of 2016, 42.1 million hairbrushes were imported, up less than 1 percent from 41.9 million for the first 11 months of 2015. China shipped 41.6 million hairbrushes to the United States during the first 11 months of 2016. The average price per hairbrush was 24 cents during November 2016, down 20 percent from 30 cents for November 2015. For the first 11 months of 2016, the average price per hairbrush was 25 cents, the same as for the first 11 months of 2015. The United States imported 5.2 million shaving brushes in November 2016, down 5 percent from 5.5 million imported in November 2015. During the first 11 months of 2016, 71.3 million shaving brushes were imported, down 9 percent from 78.3 million imported during the first 11 months of 2015. China sent 49.5 million shaving brushes to the United States during the first 11 months of 2016, while Italy shipped 7.2 million. The average price per shaving brush for November 2016 was 11 cents, down 15 percent from the average price for November 2015 of 13 cents. The average price for the first 11 months of 2016 was 13 cents, up 18 percent from 11 cents for the first 11 months of 2015. The import total of paint rollers during November 2016 was 4.3 million, up 16 percent from 3.7 million for November 2015. During the first 11 months of 2016, 63 million paint rollers were imported, up 3 percent from 61.4 million during the first 11 months of 2015. China sent 51.3 million paint rollers to the United States during the first 11 months of 2016. The average price per paint roller for November 2016 was 48 cents, down 23 percent from the average price for November 2015 of 62 cents. The average price for the first 11 months of 2016 was 49 cents, down 6 percent from the average price for the first 11 months of 2015 of 52 cents. 2 percent from 227.1 million for the first 11 months of 2015. China shipped 217.7 million paintbrushes to the United States during the first 11 months of 2016. The average price per paintbrush for November 2016 was 28 cents, down 22 percent from 36 cents for November 2015. The average price for the first 11 months of 2016 was 30 cents, down 9 percent from 33 cents for the first 11 months of 2015. The total import of upright brooms for November 2016 was 1.5 million, up 15 percent from 1.3 million for November 2015. During the first 11 months of 2016, 15.4 million upright brooms were imported, up 8 percent from 14.2 million imported during the first 11 months of 2015. China sent 13.4 million upright brooms to the United States during the first 11 months of 2016.
price for November 2015 of $1.59. The average price per broom for the first 11 months of 2016 was $1.36, down 7 percent from $1.46 for the first 11 months of 2015. Export totals for the first 11 months of 2016 were down in three categories outlined: brooms and brushes of vegetable materials, shaving brushes and artist brushes, compared to the first 11 months of 2015. In November 2016, three categories outlined reported increases: brooms and brushes of vegetable materials, shaving brushes and paintbrushes, compared to November 2015.
of 2016 was $48.25, down 2 percent from $49.42 for the first 11 months of 2015. During November 2016, the United States exported 11.1 million toothbrushes, down 38 percent from the total recorded in November 2015 of 17.9 million. During the first 11 months of 2016, 162 million toothbrushes were exported, up less than 1 percent from 160.6 million exported during the first 11 months of 2015. The United States exported 62.3 million toothbrushes to Canada, 23.1 million to Germany and 19.3 million to Mexico, during the first 11 months of 2016. The average price per toothbrush for November 2016 was 58 cents, up 43 percent from 33 cents for November 2015. The average price per toothbrush for the first 11 months of 2016 was 47 cents, up 1 cent from the average price for the first 11 months of 2015. The United States exported 1.3 million shaving brushes during November 2016, up 30 percent from 1 million for November 2015. During the first 11 months of 2016, 15.2 million shaving brushes were exported, down 3 percent from 15.6 million for the first 11 months of 2015. Brazil imported 6.5 million shaving brushes from the United States during the first 11 months of 2016, while Canada received 3.3 million. The average price per shaving brush for November 2016 was $1.19, down 18 percent from $1.45 for November 2015. The average price for the first 11 months of 2016 was $1.21, up 8 percent from $1.13 for the first 11 months of 2015. November 2016 exports of artist brushes totaled 1.1 million, the same as for November 2015. During the first 11 months of 2016, 10.3 million artist brushes were exported, down 10 percent from 11.4 million for the first 11 months of 2015. Canada received 6.3 million artist brushes from the United States during the first 11 months of 2016, while Haiti imported 1.3 million. The average price per artist brush was $2.87 during November 2016, up 15 percent from the average price for November 2015 of $2.49. For the first 11 months of 2016, the average price per artist brush was $3.53, up 46 percent from the average price for the first 11 months of 2015 of $2.42. Canada imported 1.5 million paintbrushes from the United States during the first 11 months of 2016, while the United Kingdom received 457,156. The average price per paintbrush for November 2016 was $7.74, down 35 percent from $11.95 for November 2015. The average price for the first 11 months of 2016 was $5.71, down 54 percent from $12.46 for the first 11 months of 2015. Click here for the entire November 2016 Import/Export Statistics. Mill-Rose Brush Manufacturers Luncheon in January. Mill-Rose Brush Manufacturers luncheon in downtown Cleveland, OH. the event, hosted by Mentor, OH-based The Mill-Rose Company. 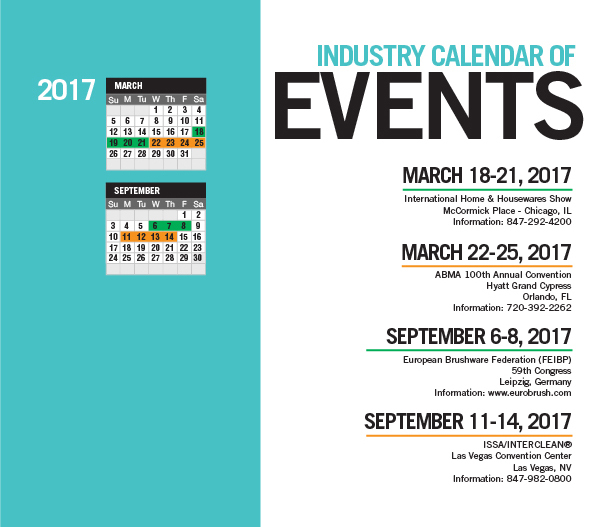 Manufacturers and suppliers gathered during the week before the luncheon to discuss business trends, opportunities and other topics related to the brush industry. Mark Fultz, president and CEO of Abtex Corporation and president of the American Brush Manufacturers Association (ABMA), also addressed the gathering. Local and regional companies attending the event included Malish Brush, Precision Brush, Sherwin Williams, Spiral Brush, Brushes Corp., Phillips Brush and The Mill-Rose Company. The Mill-Rose Company is a U.S. manufacturer of twisted-in-wire brushes. It is a family-owned organization, now in its fourth generation. Today the company operates manufacturing and warehouse facilities throughout the United States and Mexico. take place at the Grand Hyatt Resort and Spa, in Kauai, HI, on Oct. 1-5, 2017.
according to Gordon Brush President & CEO Kenneth L. Rakusin. reservation, which is fully refundable until Aug. 31, 2017. The location of the meeting is The Grand Hyatt Resort and Spa, 1571 Poipu Rd., Koloa, HI 96756. 15 percent discount at Anara Spa, excluding retail purchases,” Rakusin said. There will also be several opportunities for golf. rate is $178 per person on this course (www.hokualakauai.com/golf),” Rakusin said. “On Wednesday, October 4, also in the morning, a scramble tournament will take place next to the Hyatt at the Poipu Bay Golf Course. This is another beautiful course that also has many holes along the ocean and a special rate of $180 per golfer (www.poipubaygolf.com). products for surface conditioning, has added Tiger® Ceramic to its portfolio of bonded abrasives. 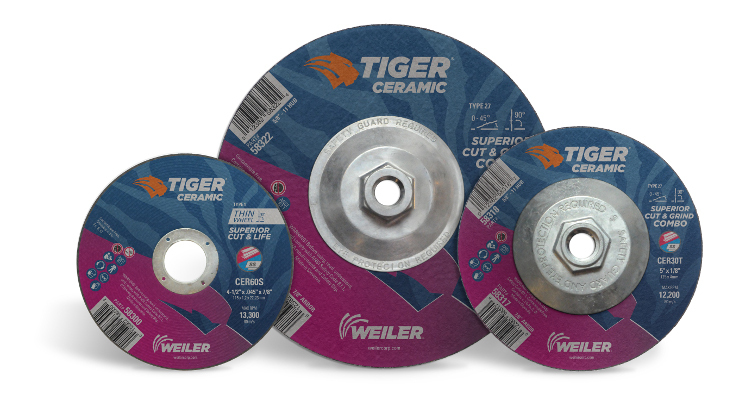 According to Weiler, “Tiger Ceramic is a maximum performance line of cutting, grinding and combination wheels that delivers a superior combination of product life and cut rate — to help users maximize time on the job in a wide range of metal fabrication applications. nickel alloy, titanium and armored steel. Visit www.weilercorp.com/ceramic for more information. all in Rochester, NY. She is a graduate of the University of Oklahoma. 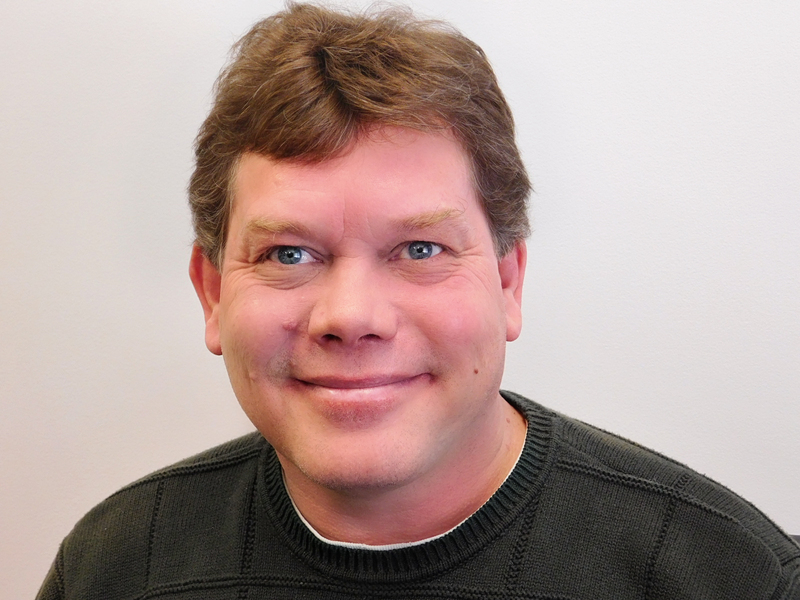 Sherman brings 15 years of manufacturing experience to the position. Prior to Abtex, he worked for Guardian Industries, in Geneva, NY, Avnet, in Rochester, and Badger Technologies, in Farmington, NY. He lives in Penn Yan. powdered-metal applications. Visit www.abtex.com for more information. “Gordon Brush Mfg. Co., Inc., has revamped its Milwaukee Dustless Brush logo. The new logo reflects the brand's American heritage, and coincides with its 120th Anniversary. Milwaukee Dustless Brush is one of the oldest manufacturers of brooms, brushes, and squeegees in the United States,” said the company. Visit www.milwaukeedustless.com and www.gordonbrush.com for more information.